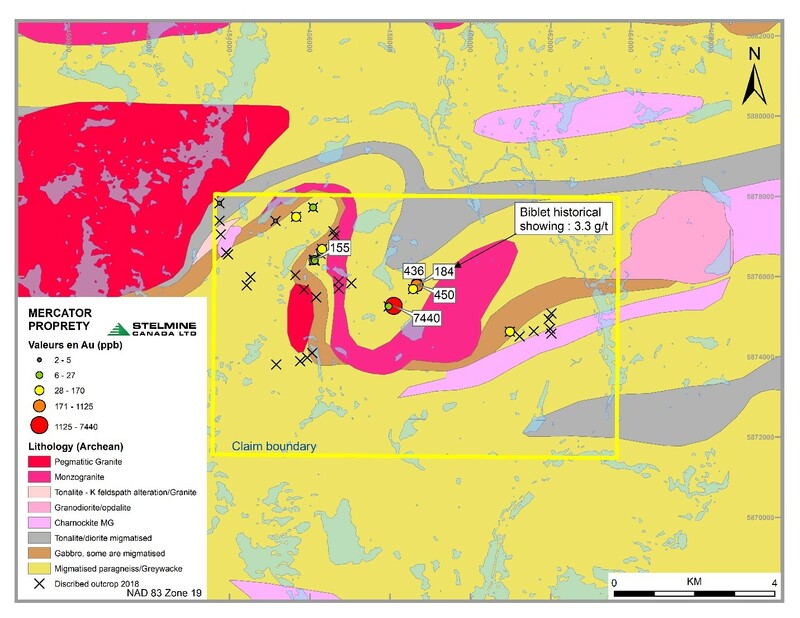 The Mercator property is located 76 km from Stelmine’s flagship Courcy property and 170 km WNW of the main road joining Fermont, Wabush and Labrador City at the border of Quebec and Labrador. The property consists of a group of 126 continuous claims, 100% owned by Stelmine and totalling 65.3 km². The mineralized zones constitute sulfurized and oxidized metasedimentary sequences (2-10 %; mainly pyrrhotite±pyrite) within amphibolite-rich (grunerite) and garnet-rich layers possibly forming iron formations. The Mercator property is located within the extension of the Opinaca metasedimentary sub-province just south of the western segment of the Ashuanipi sub-province and east of the contact with the La Grande sub-province. Most metasedimentary rocks are constituted of greywackes, arenites, siltstones and iron formations (mostly chert). The rocks are highly metamorphosed and migmatized and are largely represented by paragneiss some of which may be dioritic gneiss. The rocks probably belong to the Hublet Group (Mercator Fm). The main plutonic rocks are constituted of migmatized tonalites revealing 15-35 felsic mobilizates of granitic composition.